What comes up in your mind when you think of spring? For me, a South Korean, it's cherry blossoms. Many streets in South Korea, Japan, China, and Taiwan burst into bright pink and white blossoms each spring. In Seoul, cherry-blossom time is festival time, as people pour into the streets to celebrate the full blooms. People celebrate by bringing street food to picnics along the Han River in South Korea's capital, are common for one week. 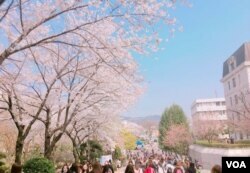 For university students in South Korea, the joke is that cherry blossoms mean midterms because exams start when cherry blossoms are in full bloom. They start studying when the blooms first appear. “It is really sad how I have less and less time to enjoy the cherry blossoms now that midterms are just around the corner," said Chaerim Kim, a senior at Sookmyung Women’s University in South Korea. In Japan, cherry-blossom festivals, called "hanami," also include picnics, often in cemeteries under bowing trees. Hanami generally indicates cherry blossom viewing. People bring home-cooked meals, make barbecue or buy take-out food to mark the occasion. In areas with lots of cherry blossoms, there's fierce competition about where to celebrate, according to About Travel. Chefs incorporate cherry blossoms into their seasonal dishes and desserts, like cherry-blossom soups and ice cream. Sake, the popular Japanese rice wine made by fermented rice, also gets into the spirit of the season. Sake flavored with cherry blossoms is a wonderful spring treat in Japan, according to Kyotofoodie. Since the early 1900s, Asian ambassadors have gifted the U.S. with those cherry trees, which line the Potomac and Anacostia rivers in Washington where Americans have picnics. Besides Washington, Baltimore and the Eastern seaboard, cherry blossom festivals are also celebrated in the west and south. For those who don't know where to go to enjoy beautiful cherry blossoms, here are some suggestions for cherry blossom festivals in the United States. Each spring, more than 1.5 million people head to nation’s capital to see beautiful and fragrant Japanese cherry blossoms. Washington, D.C. hosts the largest cherry blossom festival in the United States, called the National Cherry Blossom Festival. It takes place in late March or early April every year and it celebrates the 3,000 cherry trees from Mayor Yukio Ozaki of Tokyo to Washington, D.C. in 1912, according to the National Cherry Blossom Festival's website. The festival spans four weeks and is enjoyed by more than 1.5 million people. This year, the weather in Washington had been unusually warm and the festival began five days early on March 15. Snowstorm Stella hit Washington, D.C. March 14 a day before the festival kicked off. The National Park Service announced on March 15 that surviving blooms are expected to peak between March 19 and 22, but fewer blossoms will burst because of the recent cold temperatures. New York also has beautiful cherry blossoms in spring. One of the most famous and largest cherry blossom festivals in New York is Sakura Matsuri at the Brooklyn Botanic Garden, offering over 60 events and performances that celebrate traditional and contemporary Japanese culture. There will be a Japanese tea room, an art gallery, a "flea" market -- or a market that sells secondhand goods outdoors -- and fun entertainment like taiko drumming, cosplay actors, samurai sword masters, J-rock bands, stand-up comics and dance parties, according to Time Out. Sakura Matsuri is the weekend of April 29-30. A daily ticket cost $25 for adults, $20 for students and seniors, free for children under 12. In 1926, Japan gifted Philadelphia 1,600 cherry trees in honor of the 150th anniversary of American independence. To commemorate the international friendship with Japan, Philadelphia celebrates the beautiful blossoms and Japanese culture by holding the Subaru Cherry Blossom Festival at the Horticulture Center in Fairmount Park. The festival is held for one week each spring, and this year's festival will be on April 1 to 9, according to the Subaru Cherry Blossom Festival's website. San Francisco hosts the Northern California Cherry Blossom Festival, the second-largest cherry blossom festival in the United States. Each year, over 200,000 people visit this festival to see the beautiful cherry blossom with the grace of the Japanese culture, according to the festival's website. Visitors can participate in Japanese cultural programs like Japanese doll-making martial arts. The festival will be held April 8-9 and April 15-16 in San Francisco’s Japantown, one of the only three remaining Japantowns in the United States, according to Travel Translated by Culture. Seattle was also gifted 1,000 cherry trees by the Japanese Prime Minister 40 years ago in celebration of the nation’s 200th anniversary. Seattle reciprocated by holding its Seattle Cherry Blossom and Japanese Cultural Festival. The festival explores Japanese culture through traditional games, learning how to write shodo, orJapanese calligraphy, and trying on kimono and yukata, traditional Japanese robes. The festival is April 21-23. The International Cherry Blossom Festival is held every spring in Macon, Georgia. According to Travel Translated by Culture, Macon is originally a sleepy southern town, but becomes a fabulous cherry blossom city each spring as over 300,000 Yoshino cherry trees bloom in all their glory. Unlike the other cherry blossom festivals, International Cherry Blossom Festival is not associated with Japan or Japanese culture. It is more like a state fair. The festival offers various events such as animal shows, concerts, galas, fair rides, and bus tours along scenic cherry blossom trails. The festival is held for 10 days every year, this year from March 24 to April 2. The Nashville Cherry Blossom Festival was started in 2009 by planting the first 100 of 1,000 cherry trees at Nashville Public Square. The mission of the Nashville Cherry Blossom Festival Committee is to plant 100 cherry trees each year until 1,000 are planted. So far, 800 cherry blossom tress have been planted throughout the city. The festival is an annual celebration of spring and Japanese culture, and it offers various fun events such as a cosplay contest, parades, and Sumo Suit Wrestling. This year, the festival is scheduled for April 8 on the Nashville Public Square. Where is your favorite place to celebrate cherry blossoms? Please leave a comment here, and visit us on Facebook, Twitter, Instagram and LinkedIn, thanks!